There are plenty of casino players out there who love to play card games and there are equally different kinds of variations of the game. Out of all the card games that are played in online as well as land-based casinos, Blackjack holds one of the topmost positions because of its sheer entertainment and great chances of winning. Besides keeping you entertained for quite a time, the game of blackjack requires some serious skills to grab real money. Many popular gaming software providing companies have developed different versions of the game on the basis of their popularity in different geographical locations. 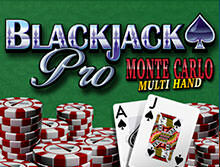 BlackjackPro Monet Carlo MH has been developed by NextGen Gaming, where MH stands for multi-hand. NexTGen Gaming is considered as one for the leading casino software developing companies in the casino industry out there. bCasino is a UK-based popular online casino licensed by the UK Gambling Commission. It contains a wide variety of Blackjack games, of which BlackjackPro Monte Carlo MH is one. bCasino is a must try casino to play Blackjack games. Blackjack Monte Carlo Multi-Hand game is similar to the standard version of blackjack but comes with many added features that make it popular amongst the players. This version of the blackjack is quite popular in many cities such as Las Vegas, Atlantic City and other cities of Europe where casino games are played. Developed by NextGen Gaming that is known for its quality games with world-class graphics and realistic sound effects, BlackjackPro Monet Carlo MH game is suitable for all the low rollers. Even the novice players who are aware of the rules of the blackjack game can easily play the game. The casino software developing company has designed the game in a manner that makes it self-explanatory. Moreover, there are sections for the game rules that you can read before beginning with the game. The chips in the game range between $0.5 and $100 making it an ideal game for those who have a low bankroll. Below it are the options to place bets and chips placed alongside. At the bottom of the screen, you will find your balance, total stake, and the amount you have. At the bottom right of the screen, you will see a wrench-shaped icon, clicking on which opens different game settings options such as audio, game speed, and color. You can choose these options as per your preference. On the top left of the game interface, you will see ‘Game Rules’ written. Click on it to open the rules of the Blackjack Pro Monte Carlo MH game in a new browser tab. This European variant of the popular blackjack game is played with the help of six decks of 52 cards without including the jokers. Before the beginning of each deal, cards are shuffled to ensure fairness in the game. The game revolves around the aim of beating the dealer by collecting a high score and not exceeding the worth of 21. Another way to win the game is when the dealer gets ‘Busted’. It happens when the dealer’s hand goes greater than 21. You can play this game with the options of one, two or three hands as per your choice. The bets for each hand lies in the range of few cents and ten thousand credits. The exact bets are decided by the casino. Therefore, we would recommend you to read the rules and terms and conditions of the game before starting the game. While dealing the cards, two initial cards are dealt with each active hand and the dealer gets one face-up card. All the face cards carry the value of 10. Also, aces are worth 10. And all the other remaining cards bear the face value. The dealer’s hand is completed after all player hands are finalized. The dealer must draw to 16 and stand on all 17. The dealer’s blackjack takes all bets besides player’s blackjack. This is termed as a “push”. Players are permitted to split any card that belongs to the same rank. Players can split a hand just once. You can add just one card to the split aces. An ace and a ten-value card cannot be allowed to form a blackjack after a split has happened. Players are allowed to double on the 1st two dealt cards if the score stands at 9, 10 or 11. If a player has made a double, he will be dealt with only one card. Players are allowed to double after the split. If the dealer grabs an ace, you are allowed to play an insurance bet. This special bet is provided for each box individually and the bet cannot be more than a half bet. The calculation of the payouts in the game is conducted using standard multipliers. For example, 1:1 is for winning hands, 3:2 is for blackjack, and 2:1 is for insurance bets. If your card reaches a total value closer to 21 than the value held by the dealer, then you are bound to win your bet sum. If both the dealer and the player reach the same total of the cards, then, in that case, your bet amount gets back to you and this move is called a “push”. However, if the total of your cards is more than 21, you will lose to the dealer and be declared as a “bust”. Once you are busted, you lose your bet. The theoretical return to player rate (RTP) of the BlackjackPro Monet Carlo MH is 98.54%, which indicates that players can win some serious money if they apply a proper strategy. If you are hoping for bonus games and jackpots, then you are in for a disappointment as the game has no bonuses and progressive jackpots. If you get the first two cards same that are dealt to both the player and the dealer, then there could be a split. If a split happens, a bet equal to the original bet is placed on each hand. The hands involved in the split are played separately. In such a case, each hand is resolved in turn after one card is delivered to each hand. Double Down happens in a case where the starting two cards that are dealt to the player and the dealer hold values as 9, 10 or 11. The double down is made at the starting of the bet for the particular hand. Players can also double down the split hands where the initial two cards are 9, 10 or 11. When a double down happens, a bet equal to the original bet on that particular hand is placed. Insurance occurs when the dealer’s face-up card is an Ace. 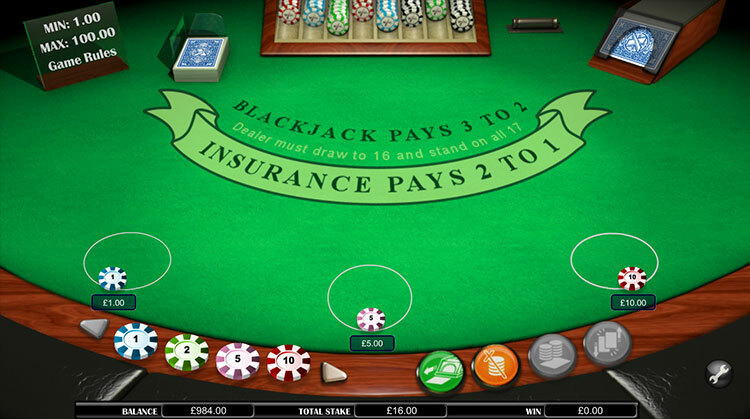 In case the player accepts an insurance offer, another bet that is equal to the half of your actual bet is placed before the dealer’s hand is checked for blackjack. If the dealer gets the blackjack, you win your insurance bet. However, if the dealer does not get a blackjack, you lose your insurance bet. BlackjackPro Monte Carlo MH casino game is one of the variations of the classic blackjack game. The game has been developed by the NextGen Gaming, which is a very popular gaming software developing company providing some of the well-known titles that are liked by the players all over the world. The game offers entertainment and a chance to win some money to the players.